The Bank of Canada released their financial system review today which shed some vital insights on household debt, mortgage originations and the housing market. It’s a 44 page report that economic geeks have been salivating over for weeks. However, i’m sure you’d rather not bore yourself to sleep, so i’ll provide some the key takeaway’s here. When the previous mortgage stress test was introduced in November 2016 it targeted insured borrowers. Meaning, people who were borrowing with less than 20% down had to pass a stress test. Borrowers, particularly in Vancouver & Toronto who were desperate to participate in the housing market began to get creative and found various ways to come up with a 20% down payment. (18% of down payments now come from The Bank of Mom & Dad. Low ratio mortgages, meaning borrowers with 20% down or more increased from 85% of all loans in Vancouver to 90%. This is also due to increasing home prices which requires a 20% down payment on all purchases above $1M. First off, 90% of all mortgages in Vancouver are now low-ratio. This basically means most of these borrowers were previously exempt from the last stress test. Is it any wonder we didn’t see much impact. The Bank of Canada now estimates that under the new mortgage stress test it will eliminate 12% of low-ratio borrowers from qualifying for a mortgage. Meanwhile 46% of high ratio borrowers were from Vancouver & Toronto. Can Credit Unions Absorb the Difference? The short answer is highly unlikely. Per the Bank of Canada, credit unions only account for 17% of uninsured mortgages. With many credit unions cutting off their mortgage broker channel (meaning they will only service existing customers of the bank) it suggests capital is running low. The excess demand will allow credit unions to cherry pick the most qualified borrowers while kicking the rest of borrowers to the curb. The Bank of Canada only provided private mortgage lending data for Ontario. But essentially 10% of all new mortgage originations are from private lenders or MIC’s (Mortgage Investment Corporations). It’s likely a similar number in Vancouver. The typical interest rate for these mortgages was 10% for a term of one year. Usually after that borrowers re-finance with a traditional lender. Of course this strategy typically only works in a rising house price environment. 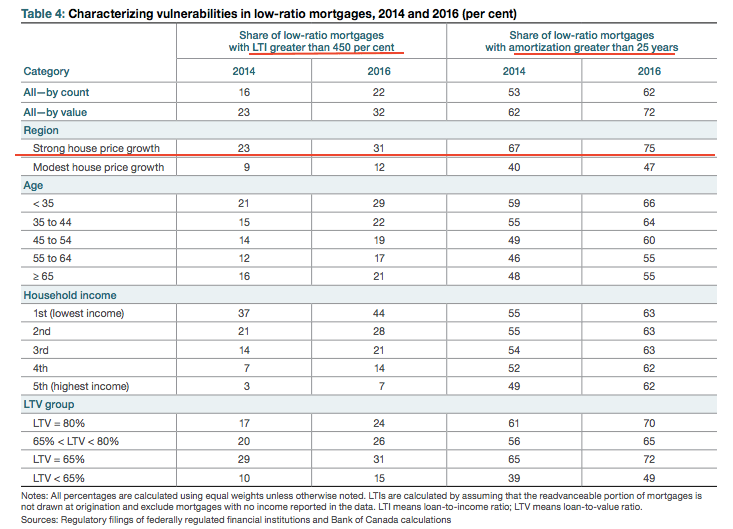 The share of low-ratio mortgages with an LTI (loan to income) above 450% is greatest in markets with strong house price growth (Vancouver & Toronto). A similar pattern emerges for borrowers with extended amortizations. In regions with strong house price growth, 31% of low-ratio mortgages had a high LTI (loan to income) in 2016, compared to 12% for the rest of the country. Extended amortization is also more prevalent in regions with high house prices. As you’ll see in the chart below, 75% of low-ratio mortgages (79% in Vancouver) had an amortization greater than 25 years. 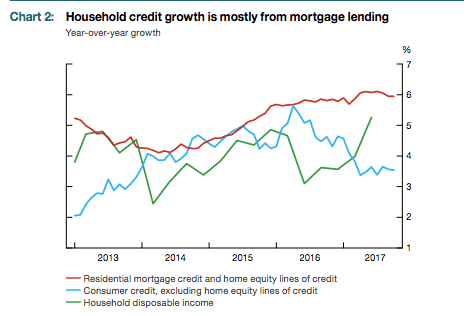 Household debt continues to expand with the majority of the debt in the form of residential mortgages which is still growing by 6% year over year. Some Borrowers in Toronto & Vancouver have switched to low-ratio mortgages in an attempt to reduce overall debt service payments while also extending the length of amortizations. It will be interesting to see how the stress test will impact all of this, especially considering 90% of borrowers in Vancouver were previously exempt (according to the data). The Bank of Canada believes it will take at least 6 months to notice any material impact.